Dr Geoff experienced a serious low back injury while playing rugby. He tried all the mainstream medical options without finding any relief. He then went to a chiropractor and was able to get back to playing. 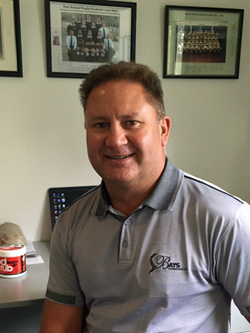 Dr Geoff took a rugby scholarship to Palmer College of Chiropractic in the US and graduated in 1999. Dr Geoff utilises various techniques to suit his patients’ needs. He focuses on Sacro-Occipital Technique (SOT) and the Gonstead technique. He also incorporates muscle flexibility and core strength into his health and wellness plan. Dr Geoff has a special interest in sports chiropractic. From social walkers to Olympic athletes, different types of patients have found a great benefit in their care with Dr Geoff. Dr Geoff is also proficient in turning breech presentation babies by using the Webster Technique. Many expectant mums seek Dr Geoff’s expertise to help them have successful pregnancies. Dr Geoff combines his love of sports, coaching, health and wellness and keeps the general public informed with articles via his professional Facebook page and LinkedIn page. He also writes regularly on his blog. Dr Geoff has been married to Kelly for 21 years. They have four children: Samantha, Grace, Olivia and Charlie and two grandchildren. Outside of work, Dr Geoff loves boating and fishing and is an avid follower of horse racing, owning a share in a two year old thoroughbred filly. He is a rugby union coach with the North Harbour 7s side and the Philippines national 7s team. Dr Geoff is a former Waikato and North Harbour 1st class and New Zealand 7s rugby player.